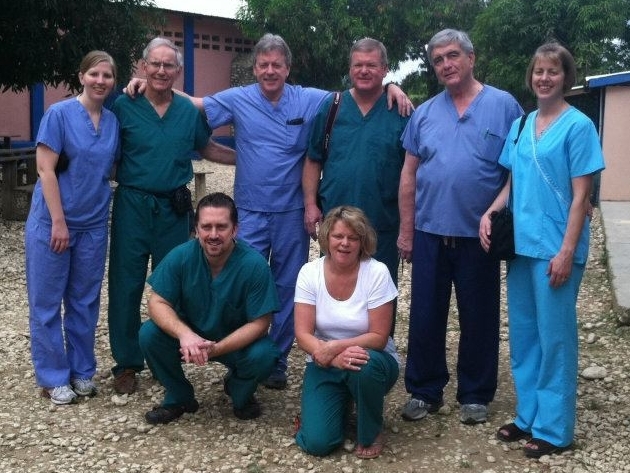 New Hope UMC helps support Dr. Michael Stark and Dr. Jeff Ward in their annual winter trip to Kobonal, Haiti. The small village is located in the highlands plateau a two-hour drive northeast of Port-au-Prince. Their clinic is located on the SOLT Mission compound which is pastored by Fr. Glenn Meaux. In the twenty-five years that Fr. Glenn has been working in Kobonol, the mission has grown to include a school which is attended by over 800 students daily, a bread-baking project, clean water for the community, a cement block casting project to build local houses, and other medical services provided by volunteers. Dr. Stark, Dr. Ward, and their support staff generally work for about a week performing cataract surgeries on local residents, many days operating from early morning until late in the evening and seeing 20-30 patients each day for surgery and follow-up.